Purpose – The dishwasher pump (and motor) circulates the water to pressurize the spray arms during the wash and rinse cycle. This pump also drains the dishwasher at the end of each cycle. 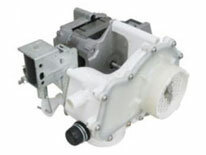 Location – The dishwasher pump is centered directly below the main cavity. Failure symptoms – Most common symptom is failure to start and run. Diagnosis – If voltage going to motor measures 110 volts and the pump motor is not running, it is bad. Bring your “dishwasher pump” in for free confirmation that it is good/bad or call the U-FIX-IT store for free assistance with diagnosis. Replacing ER GEDWM on GE dishwashers. Note: this video shows a later model pump, but the procedure is very similar.